Did you see the first episode of V this week? I missed it. You would think that the big mothership hovering over New York City would have reminded me to watch?? I was going to download it from iTunes, but I stopped myself. If Apple is going to continue its war with the Palm Pre, why should I use iTunes?? I checked abc.com and they will have the first episode of V available this weekend. In the meantime, I decided to try the new version of AudialsOne 4 on the “first look” clip. I wrote about Tunebite before as a way of re-recording iTunes video for playback on the Palm Pre (and other devices). AudialsOne is the full suite from RapidSolutions Software which includes Tunebite and a few other programs. 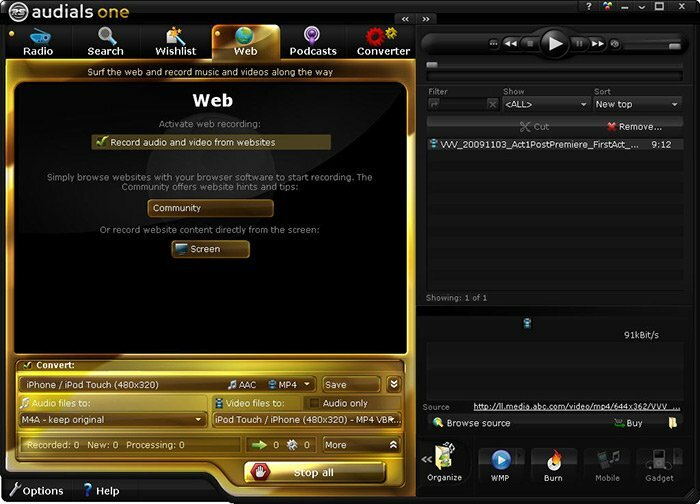 They just released AudialsOne 4 and it includes a “universal web recorder” and “universal media converter“. Basically, with the program running in the background, it monitors your web browser watching for embedded video. When it detects a video feed, it will start recording that feed in real-time as it is playing in your browser. Once the video is complete, switch back to AudialsOne and it will display the feeds it was monitoring. Just click on the feed and save it to the format you need. For the Palm Pre (and most other mini-screen displays), the iPod Touch/iPhone format works well to reduce the overall file size but maintain video quality. That’s it! The video quality is as good as the video playing through your browser and can be downloaded to the Palm Pre. But, what if the website has some fancy encryption scheme in place? You can also record the feed direct from your screen display. However, enabling this caused all sorts of error messages on my computer, and should be used as a last resort since it could require you to reset your computer’s video settings and audio settings. AudialsOne 4 also works with video from Hulu.com. So, as long as Apple continues this war with the Palm Pre, I will be using this alternative to iTunes!